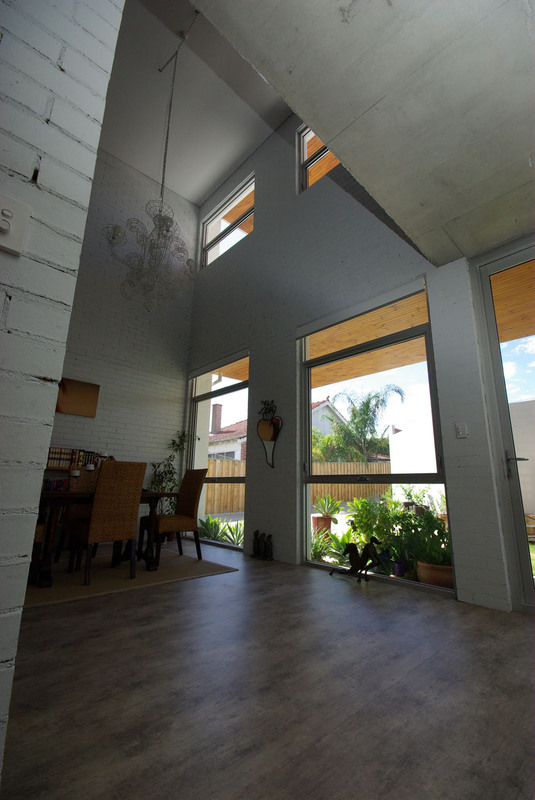 Situated on a small rear lot of 307 sqm, this home was designed for a bricklayer and his family. It needed to be a quality, low-cost housing solution, with stripped-back finishes, concrete floors and ceilings, and a fantastic sense of space. The site was situated next door to a 1940’s large red brick light industrial unit, and the area includes many buildings from that era. The starting point for the design was a reinterpretation of an industrial warehouse from a bygone era, whitewashed to provide a gallery-style space. The vast two story void you find yourself in when you enter the oversized front door has an uplifting amount of glass, and the overall feel is clean, sharp and utilitarian. As with all the buildings we design, energy efficiency is ensured by use of summer shading to the windows, good penetration of the northern winter sunlight, substantial amounts of insulation in the roof, cross ventilation and well-located thermal mass to regulate the temperature. The solid brick construction of this home will mean it will last the ages, ensuring a long term economic & energy efficiency.